Chiang Mai can be visited year round. The best months are October to February when the weather is dry and at its coolest. October to December are the best months for trekking when the sky is clear, the mountains are green and there is less humidity. By March and April the humidity is much higher and the long sunny season has dried out the countryside. These are also the months that farmers burn off their fields which can leave the air hazy. 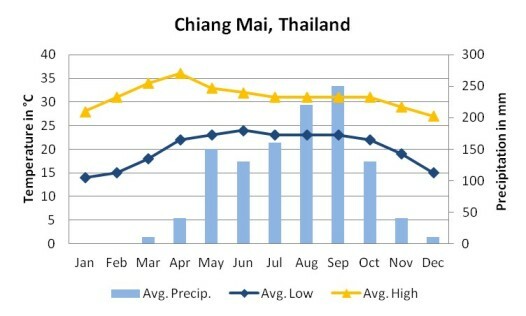 May to September is the rainy season with September statistically the wettest month. If you are coming in November you may like to plan your trip around the Loy Kratong festival which is held on the November full moon. On this night in Chiang Mai all Thai’s will descend on the Mae Ping river to float small offerings down the river on banana leaf boats. In doing so, they pay respect to the goddess of the water and float away all their troubles from the past year. The celebration is a real spectacle. If you are coming in April try to plan your trip around 13 April for the Thai New Year festival called Songkran (book your flights and hotel early for this). Northern Thailand celebrates Songkran for longer than the south of the country. Basically everyone hits the streets and throws water over each other. It’s the most fun time of the year and a real relief from the April heat. It lasts three days in the city, longer in the surrounding countryside. Whatever time of year you travel to Chiang Mai try to include a Sunday in your itinerary so that you can experience the excellent walking street market on Sunday evenings which is full of handicrafts and artwork as well as lots of food stalls.